Worcestershire County Council, in partnership with Worcestershire Telecare, is working to ensure residents in the region live a better quality of life and remain independent, with the help of ground-breaking technology. Assistive technology is currently in use at the showcase facility at Berrington Court Extra Care Scheme in Kidderminster, where innovative solutions have been designed to meet needs using mobile and interactive technology. The technology can be used for people from anxiety issues or epilepsy, to older people living with dementia. On Monday 4th February, Worcestershire Telecare hosted the official media event at Berrington Court for those in attendance to ask questions and find out more about the partnership with Worcestershire County Council. 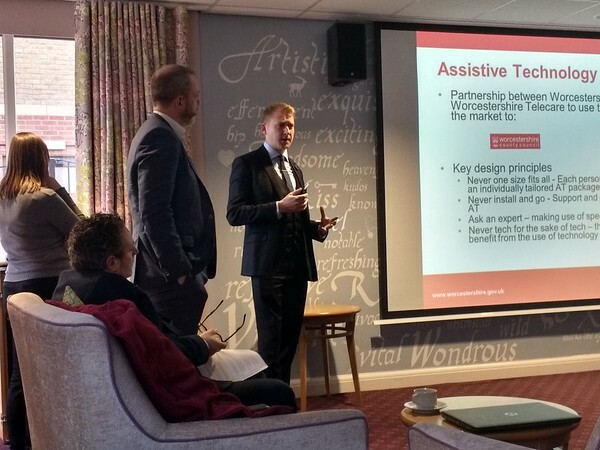 Several case studies were shown to demonstrate the positive outcomes already achieved through assistive technology. Councillor Adrian Hardman said: "We think that this is a major way of controlling demand and letting people live independent and fulfilling lives for longer in their own homes. Assistive technology I think will be buried into the care package we roll out to homes as a cornerstone from now on - and there is no doubt that by using the technology, it will have an impact on the County Council budget in due course. Hopefully the outcomes to our services will be better." It is estimated that 20% of clients who receive home care from the Council can benefit from using assistive technology, with the average cash saving per service per week being £90. The technology, which is provided by Worcestershire Telecare (part of The Community Housing Group), includes devices such as an Eyegaze system, which allows those with serious mobility problems to control items within their home, such as lights, curtains and the front door, using their eyesight. Other devices include a GPS pendent, a fire guard, as well as interactive programs on large tablets. Rupert Lawrence, Head of Worcestershire Telecare said: "This is different from previous services because it is tailored to the individual and their support network and it makes the best use of digital technologies as well. We are now living in a digital world and there are a lot more possibilities with technology."